Google Chrome 70 will start showing the red “not secure” warning when users enter data on HTTP pages, instead. Now that we all know what is a SSL Certificate and why we need it, in January, 2017 we talked about how Google identifies websites that do not have SSL (HTTPS) as Not secure, with the “Not Secure” indicator in the URL bar, when the page contained a password field or the user interacted with a credit card field. Websites with an SSL Certificate would still display the green padlock and the “Secure” indicator. That was Phase 1 of Google Chrome’s Security Team for a more secure web. “Previously, HTTP usage was too high to mark all HTTP pages with a strong red warning”. Google Chrome 70 will start displaying all websites that don’t have a SSL Certificate installed as “Not secure”, when the user inputs sensitive data. All of our web hosting plans come with a free Let’s Encrypt SSL certificate, something that Google now requires if you want your website to rank higher! “In this phase, HTTP pages will be marked as affirmatively “Not Secure” using red color and the non-secure icon in the URL bar if the user interacts with any input field.” Google Chrome team stated, again encouraging the use of HTTPS, just like when they announced that they treat HTTPS as a ranking factor. 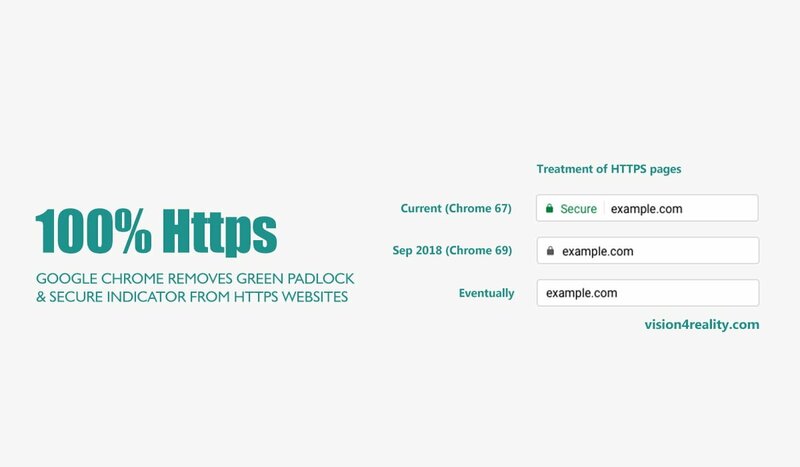 All of these phases and updates to the most popular browser in the world wide web are part of Google’s HTTPS 100% plan, that aims to have all websites loaded in Google Chrome via HTTPS. Rank higher in search results, secure and protect your website and your customers.